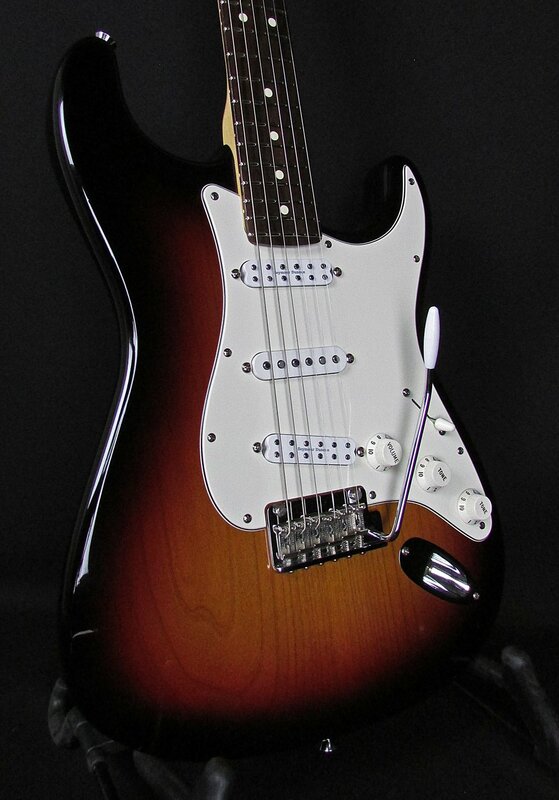 2009 Fender American Standard Stratocaster is in excellent condition and perfect playing order. Comes with the original hardcase. The original single coil bridge and neck pickups were swapped out for a Seymour Duncan JB Junior and Lil' 59, respectively. Otherwise, it's all stock! Overall it's in great shape. It does have some dings, bonks, and character marks on the top, back, and around the edges of the body. Most noticeably on the back, in between the back plate and the lower strap button, there's 3 or 4 dings. There's also some light buckle rash on back, on the treble side lower bout. Otherwise there's just polish swirls around the body. The fret have some wear, most prominently underneath the G, B, and high E string. Thankfully the back of the neck is free from any dings, dents, bonks, indentations, or impressions. Constructed from a nicely figured 2-piece alder body, bolt-on maple neck with a medium C profile and a satin finish, rosewood fretboard with 22 medium jumbo frets and a 9 1/2" radius, 6-in-line staggered Fender tuning keys, and a 2-point modern tremolo. Has a 1 11/16" nut width, standard 25 1/2" scale length, and weighs 7 pounds 15 ounces.